As harmoniously as eras may blend and blur in our collective memory, getting a good feel of what it was to be 20 or so in Greenwich Village in the early sixties may turn to be a quite fascinating journey in time. For that, you may want to read the memoirs of Suze Rotolo, A Freewheelin’ Time, published earlier this year. 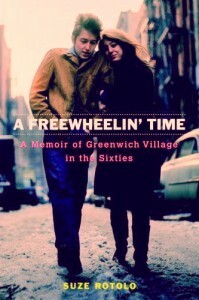 A Freewheelin’ Time: A Memoir of Greenwich Village in the Sixties. On the cover: Suze Rotolo with Bob Dylan. This is a variation of the cover for The Freewheelin’ Bob Dylan, Bob Dylan’s second studio album (May 1963, Columbia Records). The “red diaper” daughter of Italian “communists” who suffered from the McCarthy Era, Suze Rotolo, born in Queens, New York, was 17 when she met Bob Dylan, then 20, at the end of July 1961 at Riverside Church in upper Manhattan and soon became his girl friend. The book reads like the love story of young people in Greenwich Village in the early sixties: “During our time together things became very complicated because much happened to him so fast. We had a good time, but also a hard time, as a young couple in love.” Their existence intertwines with the lives of dozens of friends, musicians and artists, who also work at achieving greatness one way or the other. The book is an informal gallery of portraits and offers casual and pointed insights on a generation “who had permission to drink alcohol and die at war at eighteen, but had no voting voice until the age of twenty-one.” The McCarthy era was still very much present. Abortion was a highly risky choice (she had one in 1963). Unmarried couples were living “in sin.” Girls were more like “props” than fully-fledged human beings. They all fought against segregation and questioned the travel ban to Cuba (Suze was among the students who went there to test the ban). She broke with Bob Dylan, yet continued to live in New York and remained well-known within the circles of mainstreet-cultures-to-be subcultures. Nonetheless, her humbleness is striking: after all, she did inspire quite a few of Bob Dylan’s songs! As she recounts her life more than forty years later, she has the carefree manner of young storytellers. Sure, they all were going to be stars or legends, but first and foremost, they live their lives. I like the truthful casualness of her tone. This book is no book of history (far less boring). It is not, either, just another pompous hagiographic narrative about after-the-fact heroized artists written by a scholar (far less boring also). Thanks to Janet Kerr (above) for telling me about this book. Janet is a friend of Suze Rotolo. When they met, she was the girlfriend of John Herald, lead singer and guitarist of the The Greenbriar Boys and a pal of Bob Dylan. She was/is a musician (she played the autoharp), worked all sorts of odd jobs as most of the Greenwich villagers did and traveled a lot. She later became the General Manager of Pierre Dinand Design in New York (Pierre Dinand was one of the greatest, if not the greatest, perfume bottle designers of the second part of the 20th century and created Yves Saint Laurent’s Rive gauche and Opium, Azzaro pour homme, Calvin Klein’s Eternity for men and Obsession, to name a very few). 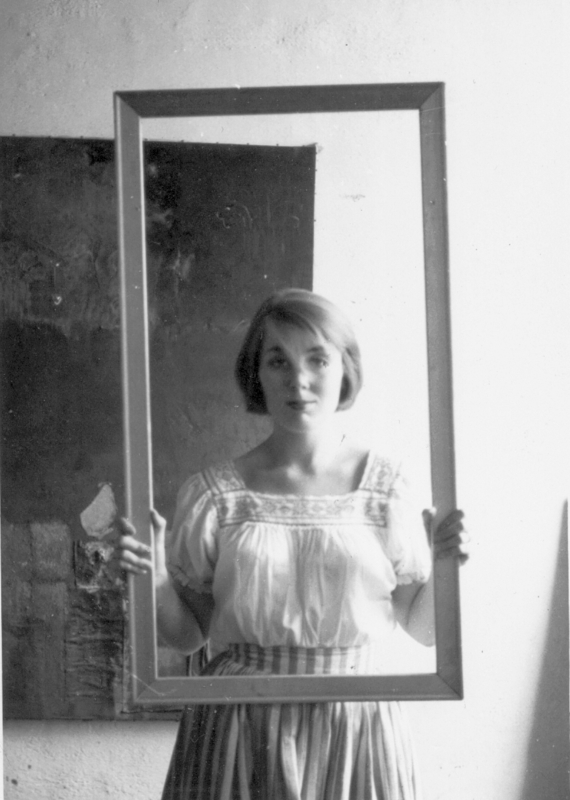 She was one of the very first persons I met when I came to New York in the early 1980’s – and I was lucky to be introduced by her to the bustling life of the TriBeCa and Lower East Side. the BOOK DINAND 50 YEARS OF DESIGN. I will send you a copy when ready.